Once believed to cure everything from mad dog bites to baldness, the onion has never ceased to amaze — both in and out of the kitchen. Onions are perhaps the most versatile veggie in existence, when it comes to cooking. There are more than 300 onion species in the world. The bulb onion is one of the common varieties grown here. The onion is a biennial plant, which means it grows one year and produces its seeds the second. Onions have a dormant phase between these two seasons. Onion bulbs are best for eating, cooking and storing before they’ve started to put their energy into making seed. The onion’s growth cycle – First-year onion plants begin their growth by putting out leaves during the cool weather. They store a lot of energy in those leaves. When the weather gets warmer and the days longer, the plants stop putting out new leaves. Instead they take the energy from the leaves and store it in the expanding bottom bulbs. Eventually the leaves shrivel up and fall over while the plant appears dormant. However, energy is being store inside the bulbs to put out flowering seed stalks when they start growing again. That’s the goal of the plant; to produce the seeds to keep its species going. No matter what starting form you choose, onions prefer growing conditions that are cool but not cold, plus well-draining moist soil, and at least six hours of full sun per day. October & early November is a good time to start onions from seed in Southern California. If you’re planting transplants, space them about 2″-6″ inches apart, depending on the onions’ mature size, and about 1/2″ deep in the ground, making sure the pointed end is facing up. Space rows about 9 inches apart. 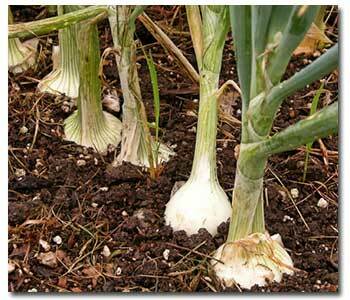 Bulbing onions are fully mature when the tops turn brownish yellow and droop over. After carefully digging them from the soil, you should leave onions either outdoors or inside in a well-ventilated area to cure for about two weeks. This will allow the outer skins to dry and will help them to store better. Onions make excellent, well behaved neighbors for fast-maturing, early spring veggies such as lettuce, as they both like the same growth conditions and can be snuggled in together without too much interference.